The AgustaWestland Apache is a licence-built version of the Boeing AH-64D Apache Longbow attack helicopter for the British Army Air Corps. The first eight helicopters were built by Boeing; the remaining 59 were assembled by Westland Helicopters (now part of Leonardo) at Yeovil, Somerset in England from Boeing-supplied kits. Changes from the AH-64D include Rolls-Royce Turbomeca engines, a new electronic defensive aids suite and a folding blade mechanism allowing the British version to operate from ships. The helicopter was initially designated WAH-64 by Westland Helicopters and was later given the designation Apache AH Mk 1 (also written as "Apache AH1") by the Ministry of Defence. The requirement for a new attack helicopter was identified by the British government in the early 1990s. In 1993, invitations to bid were issued. Bids received included the Eurocopter Tiger, a modernised Bell AH-1 SuperCobra, the AH-64 Apache, the Boeing/Sikorsky RAH-66 Comanche, and the Agusta A129 Mangusta. Both the Tiger and Cobra variant were derided for requiring development, and thus risk, while the Apache was combat proven, though its performance in the First Gulf War was criticised by competitors. Westland and the Apache was selected in July 1995, and a contract for 67 helicopters was signed in 1996. Chief of the General Staff, General Sir Charles Guthrie, 1996. The Westland Apache experienced delays in entering service due to complications with the modifications made for British service. Prior to the Apache entering service in 2004, several development problems were noted, including a lack of the ability to securely communicate with other helicopters and a risk of damage to the tail rotor and airframe from firing its Hellfire missiles. The problem with using the Hellfire was debris generated by the firing of missiles, both the Hellfire and CRV7 rockets, could strike the body of the aircraft and cause damage; resolving this issue created a delay to training programmes. These problems were corrected prior to entering service, a secure communications suite was installed and Hellfire missiles are routinely fired by Apaches. In 2002, government sources stated that full operational capability was set to be achieved by 2010. In 2005, an out-of-service date for the Apache was forecast at 2030, but the Army is looking at a capability sustainment programme (CSP) that will extend their life to 2040. It was thought that updates would be necessary by 2017 because the US Army is to withdraw support for the AH-64D Block I on which the British Apaches are based, but US budget problems pushed this back to 2019 or 2020. 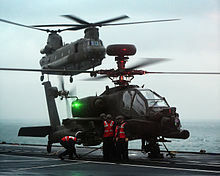 Britain was to select from the Block III upgrades of the AH-64E by 2014; options range from abandoning the capability altogether to buying brand new Block III helicopters but Boeing believe it is most likely that Britain will remanufacture, putting the existing engines and avionics into new airframes. In August 2015, the UK requested through a Foreign Military Sale, the upgrade of 50 of its Apaches to AH-64E standard. In July 2016, the UK ordered 50 AH-64Es through the US Foreign Military Sales (FMS) programme instead of upgrading their AgustaWestland-built AH-64s. Leonardo Helicopters (formerly AgustaWestland) will continue to lead the support the existing Apache AH1s until they are retired from service in 2023–24. Several deviations were made to the standard Apache design used by the US and those exported to other countries. One major difference is the use of a pair of Rolls-Royce Turbomeca RTM322 01/12 engines, replacing the original General Electric T700-GE-701C engines. The Rolls-Royce engine produces 1,565 kW (2,100 hp) vs. 1,410 kW (1,890 hp) for the GE T700C engine. Compared to many helicopters used by coalition forces in Afghanistan, the Apache required less modification to serve in the region due to special filters incorporated into the engine design. Another change is the folding blade mechanism to stow the helicopters in confined spaces; the rotor blades also have anti-ice protection to allow operations in Arctic environments. There were changes made to the sensor and avionics outfitting the craft as well; connectivity with the BOWMAN secure communications system to interact with other British military units being a significant one. The Leonardo (formerly Selex ES) Helicopter Integrated Defensive Aids System (HIDAS) was also fitted. The HIDAS system was retrofitted onto the aircraft in mid-2004 just prior to entering service, along with several redesigned composite bodywork components. An eye-safe training laser to allow the Apache to function as a target designator was also installed. Instead of the American Hydra 70 rocket pods, the Westland Apache can carry up to 76 CRV7 rockets. The CRV7 uses a modular warhead: "a high explosive, semi-armour piercing warhead for attacks on unarmoured targets and a kinetic energy penetrator, which contains no explosive, for attacks on armoured targets". There used to be a third type of warhead: the Multi-Purpose Sub Munition (MPSM), which was a controversial weapon as it has been classified as a cluster bomb; each rocket contained nine M73 submunitions. In May 2008, several senior officers, such as General David Ramsbotham spoke out against British plans to keep the weapon. In the same month, Britain, as one of the 111 participating nations, agreed to ban cluster bombs on humanitarian grounds. Britain destroyed the last of its CRV7 MPSMs in July 2009. AgustaWestland have since made several upgrades to Britain's Apache fleet. In May 2005, a $212 million contract was awarded to equip all 67 Mk1 helicopters with the Apache Arrowhead sensor system upgrade, to be completed by 2010. In 2009, it was announced that AgustaWestland was also integrating new external fuel tanks with ballistic protection. Some of the internal fuel tanks can be removed, Apaches in Afghanistan may have these removed to allow for extra ammunition for the cannon to be fitted. It has been suggested that advanced rotor blades and additional controls to improve the agility of the aircraft may be fitted in a mid-life update of the fleet. There is also a proposal to upgrade WAH-64s to the AH-64E Guardian standard. Three Apaches were deployed to Bardufoss Air Station in Norway in January 2019. The deployment, known as Exercise Clockwork, represented the aircraft's first cold weather training within the Arctic Circle. In May and June 2008, British and Afghan National Army forces conducted Operation Eagle's Eye, aimed at disrupting Taliban activities to the south of Musa Qaleh; a key portion of which was a major night-time helicopter raid, rapidly deploying members of 2nd Battalion, Parachute Regiment into the town. In June 2008, a British Apache fired a thermobaric Hellfire missile; the controversial usage of such weapons was approved after extensive legal and ethical evaluations within the MoD. In June 2008, a Taliban leader and several cell members were killed in Helmand Province by a Hellfire missile launched by an Apache of the 664 Army Air Corps. There was a friendly fire incident in July 2008, in which an Apache fired upon a position thought to be held by enemy forces, but instead hit members of a British patrol. This was the first time that a British aircraft had been involved in a blue-on-blue incident in Afghanistan. Although the Apaches have become targets for insurgents, as of November 2008[update] no British Apaches have been lost to enemy fire. In September 2008, an Apache was seriously damaged by a crash shortly after takeoff in Helmand province, no loss of life occurred but the airframe was written off. On 13 October 2010, newspapers reported that Army Air Corps maintenance workers had accidentally sent a live CRV7 missile in regular mail from Camp Bastion to the UK, a mistake which inspections had missed four times; when the missile was discovered it sparked an evacuation, the MoD later changed procedure in regards to the incident. On 25 July 2011, the MoD announced that during a combat operation in the Nahr-e-Saraj district of Helmand province, several Afghan children had been injured from crossfire by an Apache; they were flown to Camp Bastion for medical treatment. Rockets: CRV7 with Flechette (Tungsten dart) or High-Explosive Incendiary Semi-Armour Piercing (HEISAP) warheads. Until 2008 also MPSM with nine M-73 bomblets. ^ a b AgustaWestland 2011, p. 2. ^ a b c National Audit Office 2002, p. 8. ^ a b Collins, Nick (16 June 2011). "Prince Harry to return to Afghanistan". The Telegraph. ^ a b Ipsen, Erik (13 July 1995). "U.K. Must Choose 1 of 3 Attack Copters : Pitched Battle Near Done". The New York Times. ^ Cook, Nick (1 May 1995). "High Noon For Tiger And Apache". Interavia Business & Technology. ^ a b National Audit Office 2002, p. 6. ^ a b Mcgowen 2005, p. 214. ^ "British Army Receives 67th Apache In Ceremony Held At The Farnborough Air Show 2004". AgustaWestland. 21 July 2004. Archived from the original on 7 July 2011. ^ "Army Aviation: Apache Longbow Weight and Communication Issues". U.S. Government Accountability Office. 15 September 1998. ^ Maguire, Kevin (4 August 1999). "UK set to axe Apache". Daily Mirror. Archived from the original on 4 November 2012. ^ National Audit Office 2002, pp. 9, 22–23. ^ Heyman 2005, p. 114. ^ National Audit Office 2002, p. 7. ^ Smith, Michael (31 October 2002). "Warning over Apache helicopter failings". The Telegraph. ^ Hencke, David (18 November 2003). "Helicopters 'at risk' of friendly fire". The Guardian. ^ a b c d e "Apache". British Army. Archived from the original on 15 March 2010. Retrieved 3 May 2010. ^ a b Bishop and Laurier 2005, p. 47. ^ National Audit Office 2002, p. 22. ^ Hoyle, Craig (31 May 2005). "British Army stands up first Apache regiment". Flight International. ^ a b c d e Hoyle, Craig (28 November 2012). "UK weighing options for Apache attack helicopter upgrade". Flight International. ^ a b Jennings, Gareth (30 October 2013). "ADEX 2013: US sequestration buys time for UK Apache decision makers". IHS Jane's Defence Weekly. ^ "United Kingdom – AH-64E APACHE GUARDIAN Attack Helicopters". Defense Security Cooperation Agency. ^ a b Wyatt, Caroline (26 May 2011). "How UK's Apache helicopters could aid Libya mission". BBC News. ^ "General Dynamics Awarded 25 Million Pounds Sterling Apache BOWMAN Connectivity Contract". PR Newswire. 26 June 2003. ^ "Selex to focus on integrated DAS at Old Crows". Shepard. 18 October 2009. ^ Hoyle 2004, p. 59. ^ "Defense industry contracts". Flight International. 18 February 2003. ^ RAF History, CRV-7 Archived 4 April 2012 at the Wayback Machine. ^ a b "House of Commons Hansard Written Answers for 25 Mar 2010 (pt 0002)". ^ a b Myska, Sangita (19 May 2008). "UK seeks cluster bomb exemption". BBC News. ^ "The great British bomb scandal". The Herald. Glasgow. 28 May 2011. ^ "Envoys agree on treaty banning cluster bombs". GMA News Online. 29 May 2008. Archived from the original on 1 August 2012. ^ Rayment, Sean (12 June 2005). "Give us an enemy to fight, says chief of Britain's Apache helicopter fleet". The Daily Telegraph. ^ a b c "Afghan Field Report: British WAH-64Ds". Defense Industry Daily. 26 November 2007. ^ Martin, Lockheed. "AN/APR-48A Radar Frequency Interferometer" (PDF). Archived from the original (PDF) on 29 September 2011. Retrieved 20 July 2011. ^ Hoyle, Craig (1 December 2008). "British Army receives first upgraded Apaches". Flight International. ^ "United Kingdom Awards Lockheed Martin $212 Million Contract For Arrowhead System Production"[permanent dead link] Lockheed Martin. 2 May 2005. ^ Jennings, Gareth (2009). Jane's international defense review: Volume 42. Jane's Information Group. p. 25. ^ Finch 1996, p. 2. ^ Chuter, Aaron Mehta, Andrew (8 August 2017). "UK Apache Upgrade Cleared by State". defensenews.com. ^ "First Apache Attack Helicopter regiment fully operational". M2 Presswire. 25 May 2005. Archived from the original on 11 March 2012. ^ "Awesome Apache ready for action". Daily Mail. 25 May 2005. ^ "Apache Lands On U.K. Carrier Ark Royal". Aviation Today. 17 November 2006. ^ Tweedie, Neil (28 August 2006). "Troops use up ammo as war with Taliban claims 14th life". The Telegraph. ^ Watts, Robert (11 November 2007). "Half of Army gunships are grounded". The Daily Telegraph. ^ a b Rayment, Sean (22 November 2008). "Fewer than one in three of Britain's Apache attack helicopters 'fit for purpose'". The Telegraph. ^ "Supporting Britain's Apaches: AW's IOS Contract". Defense Industry Daily. 22 February 2010. ^ "Base’s Apache engineers could take strike action. "[permanent dead link] Bury Free Press, 20 June 2011. ^ Larcombe, Duncan (27 October 2008). "Prince Harry rides the dragon". The Sun. ^ "Al-Qaida threatens to abduct Prince Harry, if he flies Apache helicopter". The Times of India. 9 May 2010. ^ Harrison, Paul (17 April 2011). "Prince Harry Reaches Rank Of Army Captain". Sky News. Archived from the original on 14 July 2012. ^ "Prince Harry deployed to Afghanistan". BBC. 7 September 2012. ^ Ricks, Rebecca (29 January 2019). "Exercise Clockwork: Army Apaches Make Arctic Debut". Forces Network. Retrieved 29 January 2019. ^ "Parliamentary questions to The Secretary of State for Defence (Des Browne)". Hansard. 26 February 2007. 122586. ^ Calvert, Denis J (February 2007). "Fact File: UK Air Power in Afghanistan". Aircraft Illustrated. Ian Allan. p. 34. ^ Cairns, Dan (24 June 2011). "Precise and deadly: A pilot's view of the Apache". BBC News. ^ "Keeping the Apache ready to take on the Taliban". MOD. 12 January 2011. ^ a b Walsh, Declan (10 July 2006). "Apaches and Land Rovers versus a guy with a detonator". The Guardian. ^ Harding, Thomas (23 June 2006). "Apache earns its stripes above the Afghan battlefield". The Daily Telegraph. ^ a b c "Marines attempt daring Apache rescue during Afghanistan Operation". Ministry of Defense. 17 January 2007. Archived from the original on 5 February 2007. ^ Lewis 2009, pp. 1–3. ^ "Troops made rescue bid for marine". BBC News. 17 January 2007. ^ "Helicopter rescue marines hailed". BBC News. 22 January 2007. ^ "British troops and ANA in Apache-backed operation". MOD. 4 June 2008. Archived from the original on 5 October 2011. ^ Smith, Michael (22 June 2008). "Army 'vacuum' missile hits Taliban". The Times. ^ "UK Apache fires Hellfire missiles to kill Taliban fighters". Frontier India. 30 June 2008. Archived from the original on 14 October 2009. ^ "Nine hurt as British Apache fires on own troops". The Scotsman. 11 July 2008. ^ Hickley, Matthhew; Divid Williams (12 July 2008). "Apache hellfire probe after gunship's blunder that left nine paras injured". Daily Mail. ^ Hoyle, Craig (5 September 2008). "UK Apache crashes in Afghanistan, crew safe". Flight International. ^ Hickley, Matthew (18 February 2009). "British soldiers seize heroin worth £50m in Afghanistan airborne assault". Daily Mail. ^ a b "British Apaches Prevent Disruptions of Afghan Elections". Boeing. 20 June 2009. Archived from the original on 14 October 2012. ^ Chandler, Neil (25 April 2011). "British Troops Set To Battle Koran Propaganda". Daily Star. ^ "The Black Watch in strike at Taliban". Evening Telegraph. 5 May 2009. Archived from the original on 16 March 2012. ^ "UK forces 'kill Taliban leader'". BBC News. 2 June 2009. ^ "Bungling engineers send a LIVE missile from Afghanistan to Suffolk army airfield". Daily Mail. 13 October 2011. ^ "Afghan children injured by UK Apache helicopter attack". BBC News. 25 July 2011. ^ "British Apache helicopter injures children in Afghanistan". The Guardian. 25 July 2011. ^ a b "Apache clocks up 100,000 flying hours". Ministry of Defence. 26 May 2011. ^ Hoyle, Craig (17 May 2011). "UK Apaches score 100% in maritime Hellfire tests". Flight International. ^ "Brits Deploying Apache Choppers on Carriers Off Libya". defensetech.org. 24 May 2011. ^ "Fearful Gaddafi 'hides in hospital'". The Independent. 27 May 2011. ^ "Apaches get ready to help protect Libyan civilians". Ministry of Defence. 27 May 2011. ^ Harding, Thomas (14 June 2011). "Britain to send Apache helicopters to Yemen". The Telegraph. ^ "UK Apache helicopters used in Nato attacks". BBC News. 4 June 2011. ^ Hennessey, Patrick (4 June 2011). "Apache strike steps up battle against Gaddafi". The Daily Telegraph. ^ Sengupta, Kim (5 June 2011). "Libya: precision and restraint as Apaches hit their target". The Telegraph. ^ Sherlock, Ruth (11 June 2011). "Gaddafi hammers Misrata frontline after UK Apache helicopters strike". The Scotsman. ^ "Rebels push on as Apaches and RAF fighters strike Gaddafi's forces". British Forces News. 13 June 2011. ^ Kiley, Sam (13 June 2011). "Is Nato's Mission In Libya Losing Momentum?". Sky News. Archived from the original on 16 June 2011. ^ "UK ground attack aircraft and destroyer take on Gaddafi's forces". British forces News. 25 June 2011. Archived from the original on 22 March 2012. ^ Hughes, Christ (1 July 2011). "British Apache helicopters in Libya launch fiercest blitz yet against Gaddafi thugs". Daily Mirror. ^ "Libya: Air raid on Gaddafi military camp". BBC News. 2 July 2011. ^ Kerr, Simeon (5 August 2011). "Libyan rebels prepare push towards Tripoli". Financial Times. ^ Meo, Nick. "Libya: Nato deny Gaddafi troops shot down unmanned drone". The Telegraph, 21 June 2011. ^ "NATO loses contact with drone chopper over Libya." The Hindu, 21 June 2011. ^ Hoyle, Craig (8 July 2011). "Libya: British Army details Apache's success". Flight International. ^ "UK Defence Official Sees Good Progress in Libya Operations". defpro.com. 27 June 2011. Archived from the original on 29 July 2012. ^ "British Apache helicopters strike Libya targets". The Telegraph. 11 August 2011. ^ "Typhoon and Apache return from Libya". defencemanagement.com. 27 September 2011. Archived from the original on 21 January 2013. ^ "653 Squadron Army Air Corps". mod.uk. Retrieved 27 October 2014. ^ "662 Squadron Army Air Corps". mod.uk. Retrieved 27 October 2014. ^ "663 Squadron Army Air Corps". mod.uk. Retrieved 27 October 2014. ^ "654 Squadron's Last Parade Before Disbandment". Forces TV. ^ "656 Squadron Army Air Corps". mod.uk. Retrieved 27 October 2014. ^ "664 Squadron Army Air Corps". mod.uk. Retrieved 27 October 2014. ^ "668 Squadron Army Air Corps". mod.uk. Retrieved 27 October 2014. ^ "673 Squadron Army Air Corps". mod.uk. Retrieved 27 October 2014. ^ Apache AH Mk 1 Archived 19 June 2009 at the Wayback Machine, AgustaWestland. ^ "Boeing AH-64 Apache". Jane's: All the World's Aircraft. Jane's Information Group. 13 October 2000. Archived from the original on 16 June 2006. Retrieved 17 June 2006. ^ "Wayback Machine" (PDF). 22 October 2007. Archived from the original (PDF) on 22 October 2007. ^ "Apache AH Mk1". AgustaWestland. Archived from the original on 3 April 2011. Retrieved 4 June 2011. ^ "DSEI: Brimstone goes green for Apache integration". flightglobal.com. 18 September 2015. "AH Mk1 Apache". AgustaWestland. Retrieved 30 June 2011. Bishop, Chris and Jim Laurier. "Apache AH-64 Boeing (McDonnell Douglas) 1976–2005". Osprey Publishing, 2005. ISBN 1-84176-816-2. Finch, Roger S. "Helicopter Certification: The Challenge of Testing UK Apache". [permanent dead link] Boscombe Down: Defence Test & Evaluation Organisation, 1996. Heyman, Charles. "The British Army Guide". Barnsley: Pen & Sword Books, 2005. ISBN 1-84415-280-4. Hoyle, Craig. "Apaches At Ready – Despite Delays in Training Pilots for the Boeing/Westland Apache AH1, the British Army has no Reservations about its New Attack Helicopter". Flight International, 26 July 2004. pp. 58–60. Lewis, Damien. "Apache Dawn", Sphere, 2009. ISBN 978-0-7515-4191-5. McGowen, Stanley S. "Helicopters: an illustrated history of their impact". ABC-CLIO, 2005. ISBN 1-85109-468-7. National Audit Office. "Building an Air Manoeuver Capability: The Introduction of the Apache Helicopter". London: The Stationery Office, 28 October 2002. King, Anthony. "The Transformation of Europe's Armed Forces: From the Rhine to Afghanistan". Cambridge University Press, 2011. ISBN 0-521-76094-1. Macy, Ed. "Hellfire". Harper Collins, 2010. ISBN 0-00-728820-4. Madison, Charlotte. "Dressed to Kill", Headline Review, 2010. ISBN 0-7553-1962-1. Ryan, Mike. "Battlefield Afghanistan". Spellmount, 2007. ISBN 1-86227-390-1. Thornton, Rod. "Asymmetric Warfare: Threat and Response in the Twenty-First Century". Polity, 2005. ISBN 0-7456-3365-X. This page was last edited on 9 April 2019, at 12:01 (UTC).